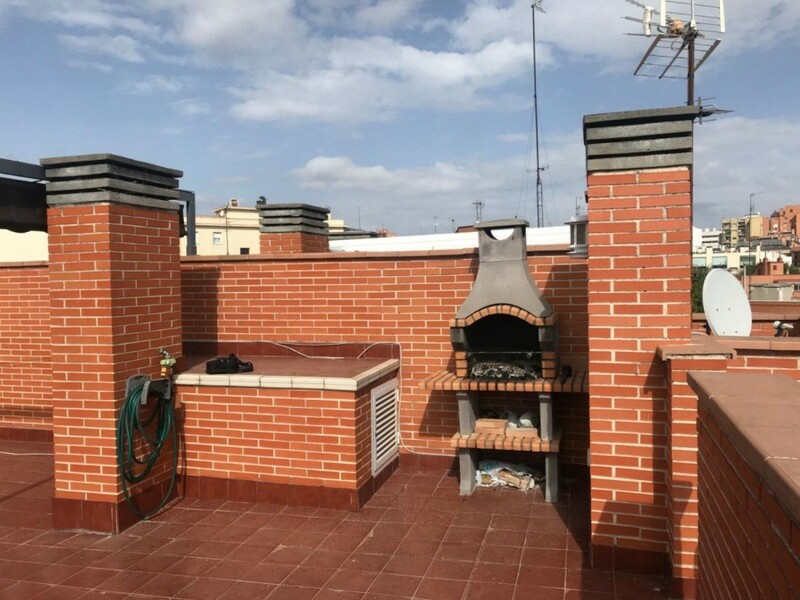 Penthouse for sale, located in the district of Tetuán, Bellas Vistas area. 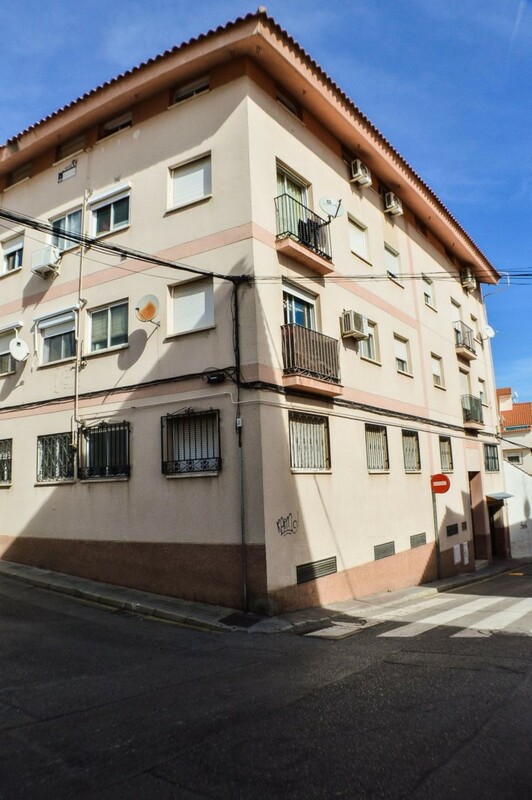 Beautiful apartment for sale in C / Zamora, next to Avda Pablo Iglesias, exterior, built in 2001 with elevator, storage room and garage included in the same building. The house has 82 m2 built according to cadastre, distributed in living room, dining room, fully fitted kitchen, 2 bedrooms with fitted wardrobes and bathroom, parquet floors, double glazed windows, fresh painted walls and ready to move into. It has 2 terraces (one of 15 m2 that can be integrated into the living room, and another terrace on the roof of 60 m2 for private use) + 1 balcony in the main room. 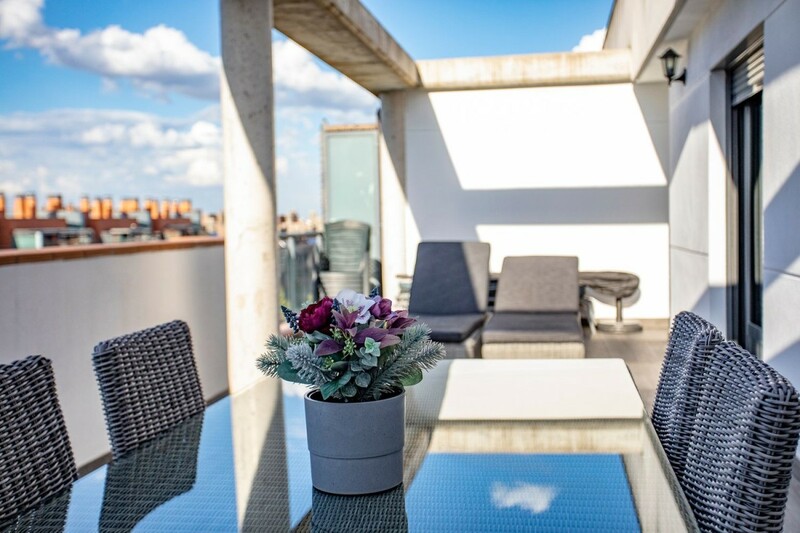 The dining room has direct access to a terrace of 15 m2 and from this you access the 60 m2 terrace with built-in barbecue, and magnificent views of Madrid. Area with all kinds of services, shops, supermarkets, hospitals, schools, restaurants. Very well connected with public transport, several bus lines, metro 5 minutes walk. Come visit him, he will love it. Penthouse with two bedrooms and two bathrooms in perfect condition for sale in the best area of Leganés, Solagua. The house consists of 94 meters built, plus 33 meters of terrace, as well as parking space and storage room of 8 meters, included in the price. The farm of the year 2008, has surveillance and common areas, which include swimming pool, gardens and children´s area. The property has multiple improvements made on origin. The living room has ceiling lighting in two areas by floating panel with different environment options, and has direct access to the large terrace of 33 meters with extruded aluminum electric security shutters and Somfy mechanisms, in door and window. 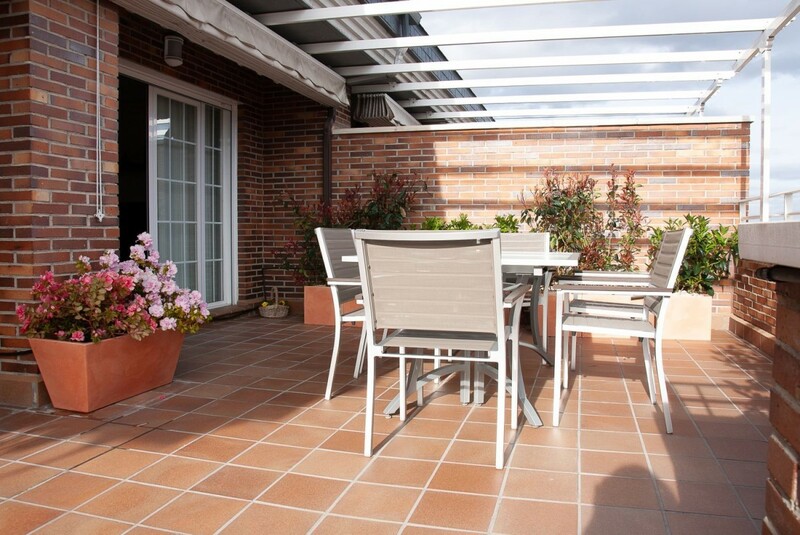 The terrace is renovated with high quality non-slip porcelain stoneware flooring. Large kitchen with porcelain floor that has a drying rack with tilt-and-turn closing, and screener electric shutter. The master bedroom, spacious and bright, has en suite bathroom with whirlpool bath and marble sink, with window with tilt-and-turn system, which leads to the terrace, and dressing area with fitted wardrobes, one of two bodies, and another of a body. The second bedroom has a built-in wardrobe, great light, and views of the common areas. The second bathroom is complete and has a shower tray. Ventilation system with cold / heat pump through duct system with access to each room, exterior carpentry with double glazing and thermal bridge break and mosquito net extensible in all windows, high quality flooring, armored door. Opportunity to acquire a great and exclusive home in a new environment, and perfectly communicated with immediate exit to M40 and M45, line 12 Metro (San Nicasio), Cercanías (C5) and bus stop at the door (486 and 487). Barrio Solagua, the best residential area of Leganés, pleasant and quiet, surrounded by parks, Plaza Nueva Shopping Center, two minutes by car, Islazul and Parquesur, with complete commercial offer, catering and services. Several schools and secondary education nearby. 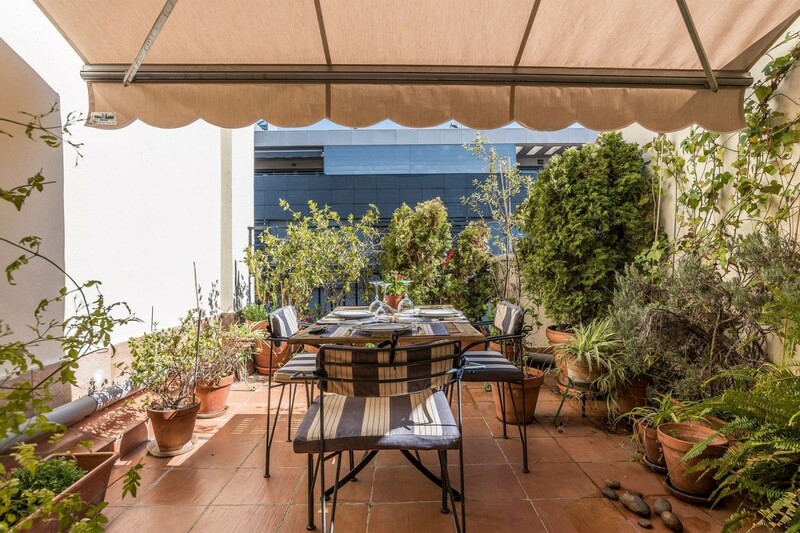 Spacious and bright penthouse with terrace in the Chamberí neighborhood. 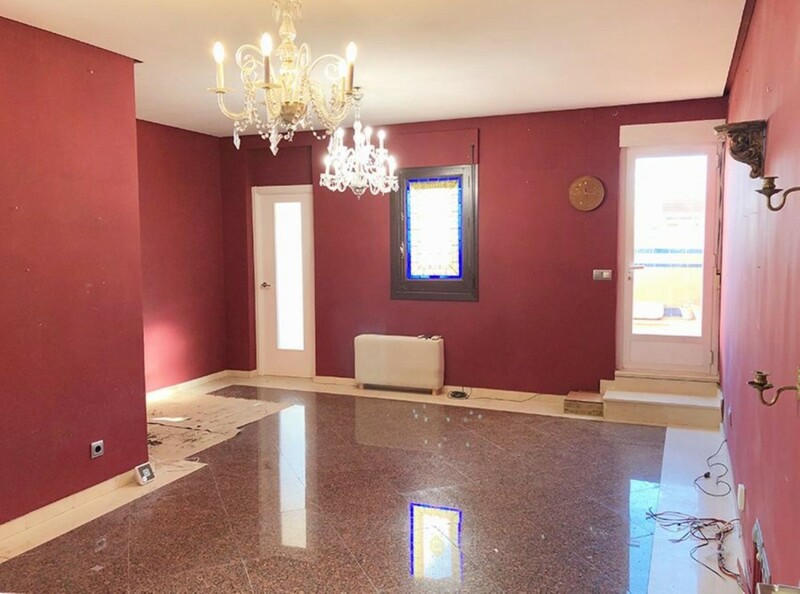 The house is completely renovated with top quality materials (marble floors, stained glass.. . ), currently the distribution consists of two bedrooms, bathroom, kitchen, a large living room (joined a bedroom to the living room, so it would be extremely easy make a third bedroom), and a large terrace with wonderful views. It is a sixth floor with elevator, in a farm with a beautiful portal which is adapted for people with reduced mobility and has a physical porter. 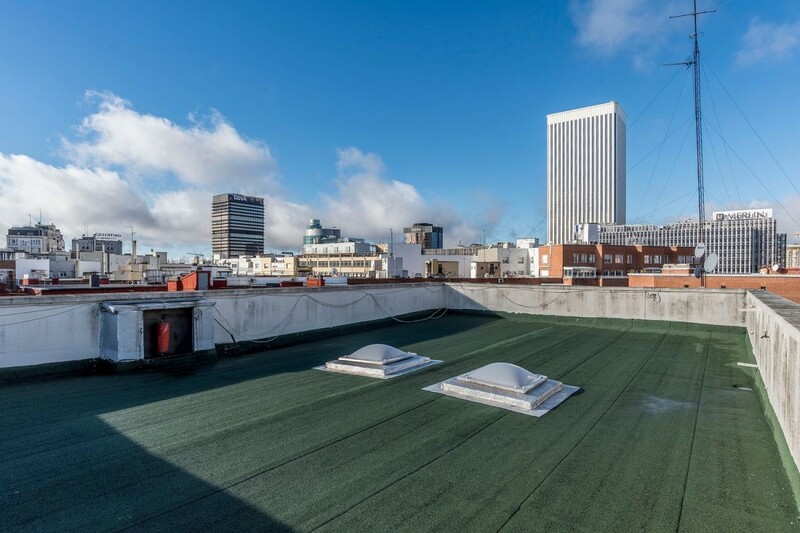 The price includes a parking space in the underground parking "Blasco de Garay", which is a great advantage since it is an area of difficult parking and with a high demand in parking spaces. 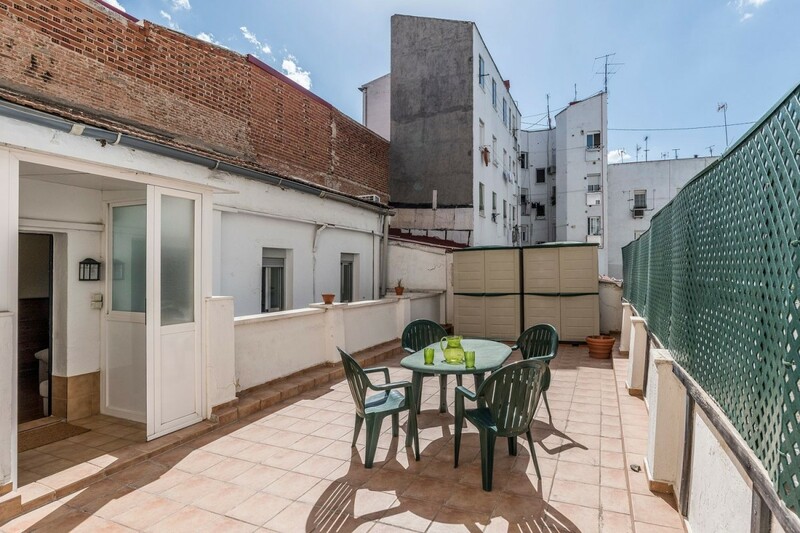 Located in one of the best and most sought after neighborhoods, it has all the services: markets, neighborhood shops, hotels, restaurants, leisure areas, banks, next to the commercial street of Princesa, and perfectly communicated in both transport public (very close to the Moncloa interchange and with access to several lines both metro and bus) as private (quick access to the A6 and M30). Do not hesitate to contact us for more information or to arrange a visit, and remember that we do not charge fees to the buyer. Duplex penthouse in excellent estate with all services. Great room on the ground floor, with access to a large terrace with double South / West orientation and awnings. Kitchen with laundry room and pantry. Bedroom and bathroom on the ground floor. Three bedrooms and two bathrooms plus two terraces on the top floor. The master bedroom has an en suite bathroom. Large storage room and two parking spaces included in the price. Individual heating by natural gas boiler and air conditioning. High quality in enclosures and coatings; marble floors on ground floor, upstairs platform and textured walls with fabric mesh. Finca with 24 hour security, Tennis and Padel courts, indoor and outdoor swimming pools, gym, sauna and common room for meetings and celebrations. Garbage room connected to the Municipal Majadahonda pneumatic collection service. 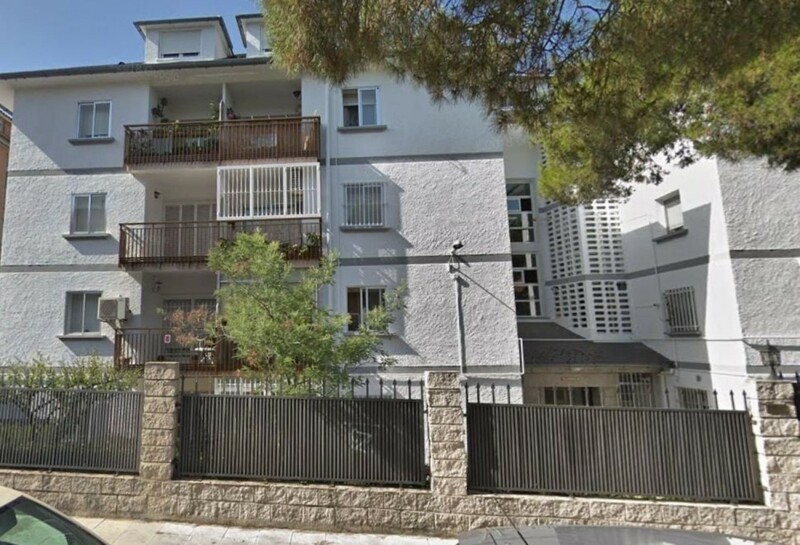 In the best area of Majadahonda, next to shopping areas, sports and health facilities. Five minutes from the M-503 and eight from the A-6, good communication by bus with Madrid and the rest of Majadahonda.